The ZyXEL GS1900-24HP with 24 Gigabit ports, PoE+ and essential managing functions provides your business network with more flexibility and connectivity. Providing GbE to desktop switches with power-saving functions, rackmount design and full IPv6 support ensure your network to be ready for future expansions. 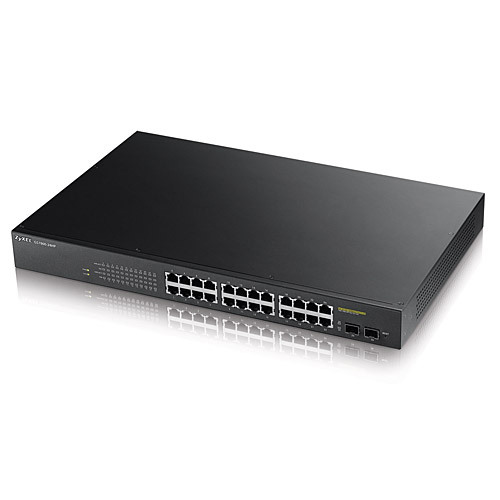 The ZyXEL GS1900-24HP 24-Port Smart Managed Gigabit PoE Switch has been designed with useful features and advanced performances that empower your networks with speed and security. In addition, the 24-port ZyXEL GS1900-24HP Gigabit switch complies with the IEEE 802.3at Power over Ethernet (PoE) Plus standard. The ZyXEL GS1900-24HP 24-Port Smart Managed Gigabit Switch provides compact size and GbE connectivity supporting multiple deployment methods to fulfill the needs for small offices and meeting room environments such as wall-, under table - or desktop-mounting options. It's now quick and effortless to enjoy the high-speed business network applications without a hitch. For small businesses that want to manage their infrastructure in advance, the ZyXEL GS1900-24HP Gigabit switch comes with a friendly built-in Web-based browser for simple configuration and management. Moreover, the friendly step-by-step intuitive wizard helps avoiding multiple complicated configuration pages for quick set up with few clicks in the matter of minutes. To guide the users from start-up, VLAN, Guest VLAN to QoS setting, the complex steps have been combined into four quick individual steps; which does not just save deployment time and efforts, but is also helpful especially for the non-IT staff. The ZyXEL GS1900-24HP Gigabit switch is equipped with advanced management features to make the network stable and secure: loop protection that prevents network flooding, dual images to provide a backup FW if one crashes and storm control to ensure network efficiency, friendly on/off DoS with simple click to enable/disable instead of several setup pages, while SSL ensures the management frames are well encrypted when the device is accessed. The ZyXEL GS1900-24HP Gigabit switch provides network error prevention features and integrated network security for reduced risk and improved data streaming. As operating overheads such as electric bills increase constantly due to the arising green awareness, businesses have to avoid unnecessary energy waste. The built-in IEEE 802.3az Energy Efficient Ethernet (EEE) and more ZyXEL innovative green features of ZyXEL GS1900-24HP Gigabit switch can reduce energy consumption of Ethernet devices through multiple intelligent ways. Traffic detection Energy Efficient Ethernet (EEE) compliance: The IEEE 802.3az Energy Efficient Ethernet (EEE) feature automatically detects network traffic and adjusts power consumption dynamically, as such the switch can reduce power consumption during low link utilization periods. ZyXEL's Intelligent PoE feature provides two PoE supply modes: classification mode and consumption mode. Especially in consumption mode, the ZyXEL GS1900-24HP Gigabit switch reserves the actual required power automatically, and you can set power feeding priorities on different ports to get the optimized use of power resource. This capability increases the number of devices connected and deliver a better ROI for the business. In addition, the ZyXEL GS1900-24HP Gigabit switch supports the IEEE 802.3at standard on all 8 ports, providing a maximum of 30 watts per port, total 70 watts, for high power consuming devices.